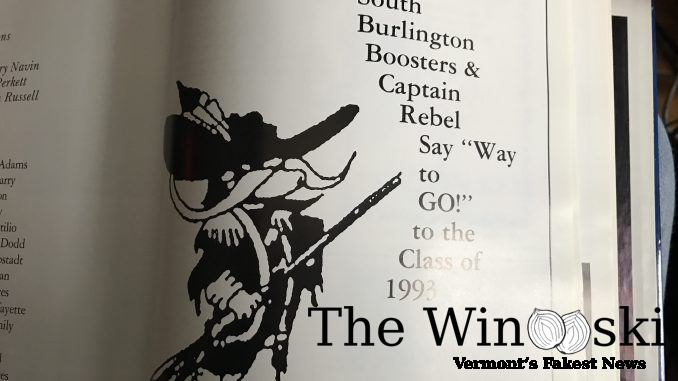 SOUTH BURLINGTON – A South Burlington community group calling itself the “Rebels Way Towards the Future” has proposed changing the names of the local high school and middle school teams from “The Rebels” to “The Clansmen.” There has been some recent controversy over the Rebel name and its ties to the civil war and the confederate flag. Group leader Jim Vicious spoke with The Winooski about the reasons for the proposed change. Wow, she sounds just as crazy as the guy we made up! Ignorance does not change facts. The name was linked to Confederate symbolism. A school most of all should not be promoting it or giving the message of disrespect to students of color– in VT and elsewhere. This Stacy has had ample opportunity to listen and be educated and has chosen not to hear. At a time when Confederate flags are increasingly popping up on homes in Northern V– ahem, you might want to check VT cemeteries to remember which side the state fought on — schools should not be promoting discrimination and erasure of people of color to the emotiinsl attachment of white people to symbols of white dominance. Give it a rest, Stacy. If Stacy wants a name that means “pride,” may we suggest The Lions? And may we also suggest a dictionary? okay, so you don’t like white people, we get it. now go crawl back into your hole. Ha ha,great article. I vote for “Teamy Mcteam Face”. Not overused, and comes with an instantly recognizable mascot. The Snowflakes are in Charlotte.